Twilight was setting in as we walked through Bonifacio Global City’s sidewalks en route to Mercato Centrale. The modern buildings towering over our heads started to sparkle with electric hues and traffic started to slow down; I looked at my watch, it was almost six, our pace quickened, the third Foodgasm was about to start! 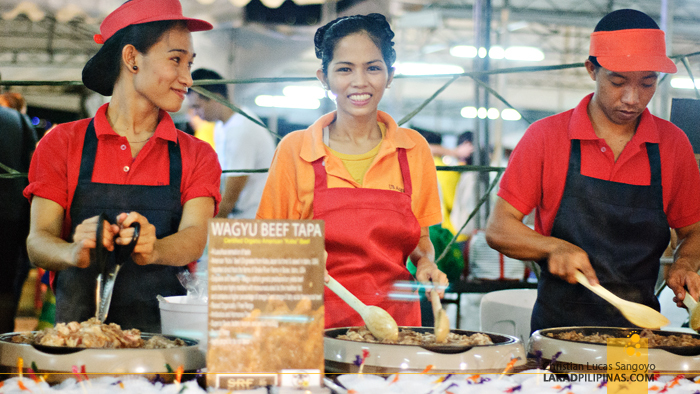 The weekend food mecca that is Mercato Centrale has always been a favorite hangout for foodies, but shamefully, I haven’t even stepped through its tents even once. Luckily, I got invited as a judge for this year’s Foodgasm. A judge eh? I’m taking off my traveler’s hat for a few hours and donning on my food hat for the night. 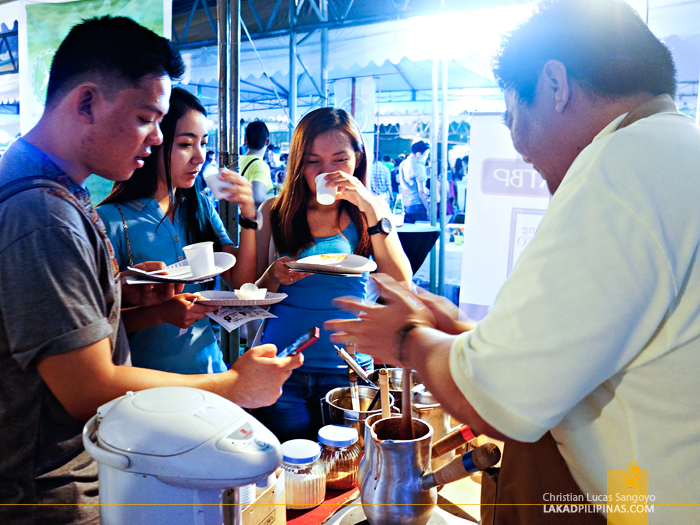 Foodgasm III is a food tasting project by the UP Economics Society. It aims to showcase thirty up and coming food businesses from around the metro. And at the end of the event, a winner would be announced according to the ratings given by foodies and judges in attendance. Preparation for the dishes and sweets being served for the night was in full swing as we entered the venue. 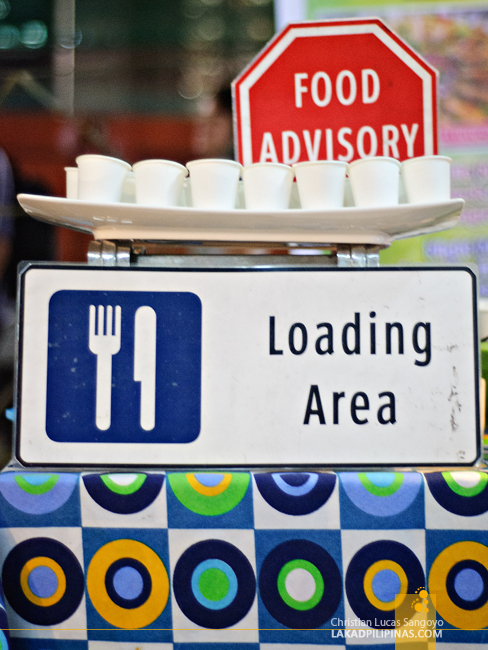 Foodgasm is housed in one cordoned corner of BGC’s Mercato Centrale and is exclusive for the thirty food business participants of the night. 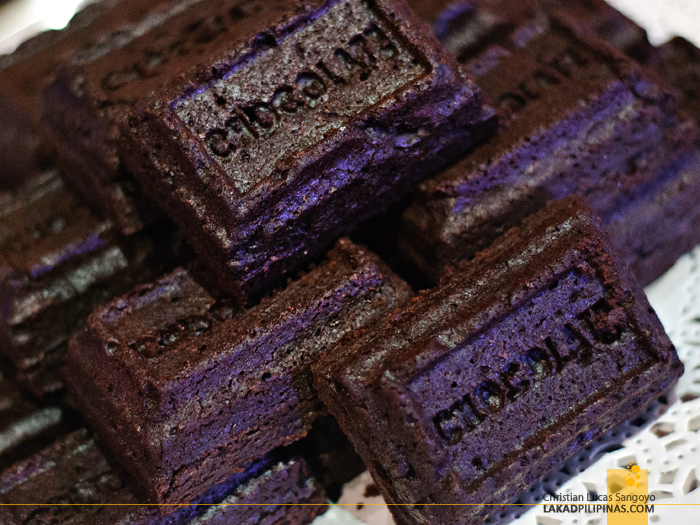 Of the thirty concessionaires joining Foodgasm III, sixteen of those are targeted to foodies with sweet tooth. 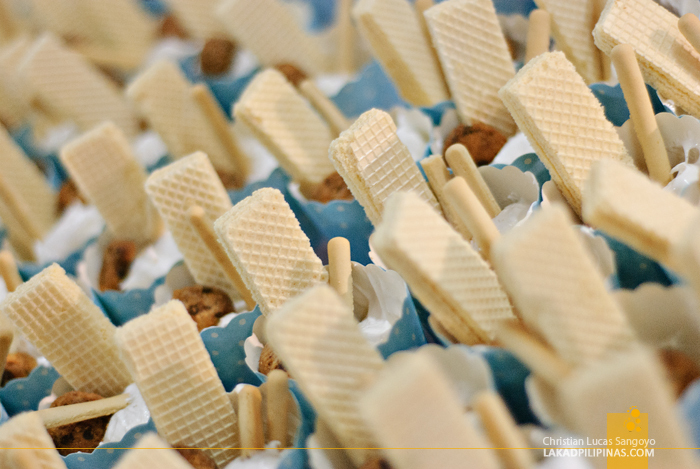 It was a feast of cakes, cookies, ice creams and cupcakes. 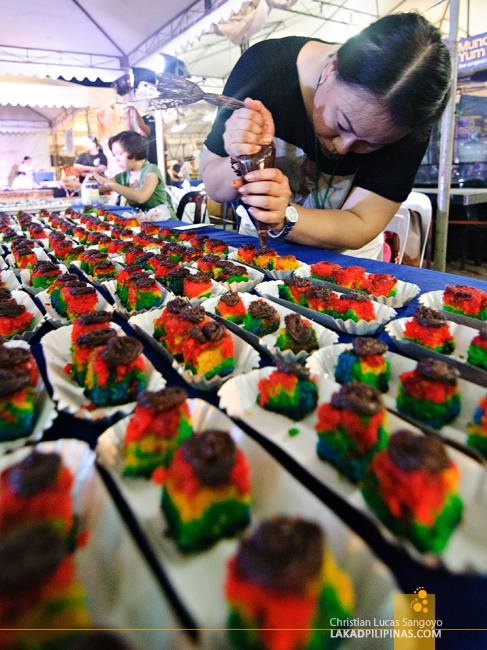 The remaining half is composed of beverages and chows like hotdogs, pastas, street fares and regional dishes. The food booths at Foodgasm are numbered from 1 to 30 and everyone seemed intent on religiously following the numbered order. A heavy crowd of foodies were already converging so we decided to start the food tasting backwards. We started at number 30. We had the stall to ourselves. Since we started at the back of the list, it’s gonna be desserts first before anything. We tried a number of mini offerings of cupcakes and sweets but what really got my attention was Eve’s Cakes & Sweets’ version of blueberry cheesecake. 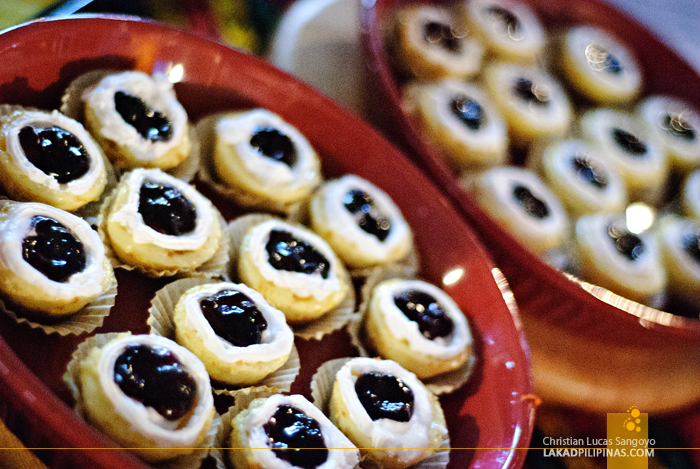 I don’t like sweets, and I’m not particularly fond of cheesecakes, but I super love theirs! I guess it’s the subtlety of the sweetness of the cake and its perfect texture. 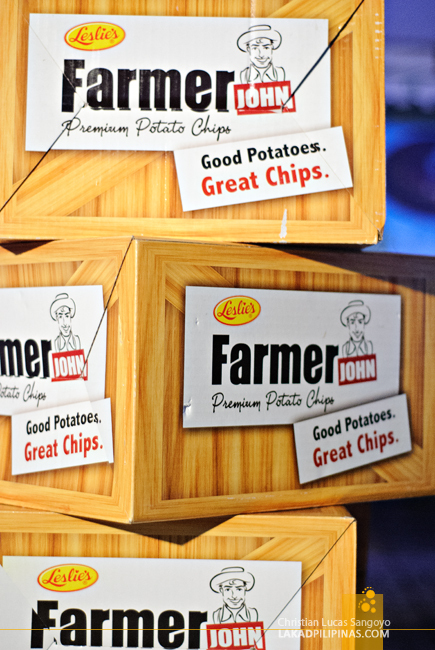 To keep our taste buds from being overwhelmed with all those sweet treats, we usually head back to Leslie’s Farmer John stall for a handful of potato chips. I know they’re really not part of the thirty food businesses in Foodgasm, but I loved them as much as my favorites in the event! One of the fares that caught my eye when I was walking around the stalls was Giga Bite’s chicken isaws. 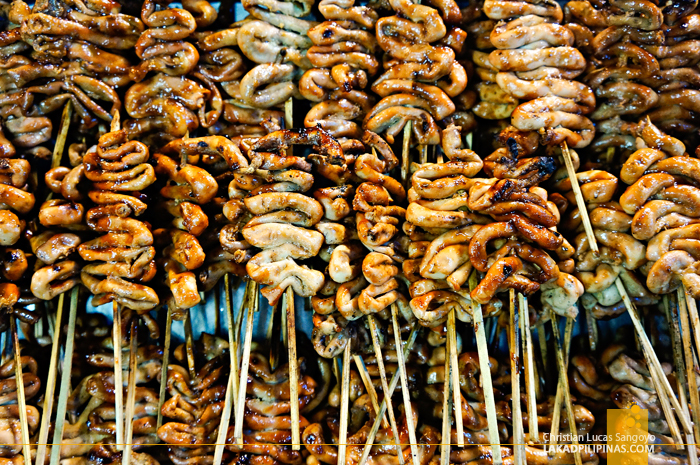 I love these street food and they’re claiming that theirs have a more of a barbeque flavor that your usual ones. The queue was quite long but I finally got mine, and was promptly disappointed. It tasted as regular as the ones being sold at street corners. It’s actually not bad but I’ve tasted better isaws. Next on my list was B. Wings’ Black Mamba. Now that’s how you name a dish! 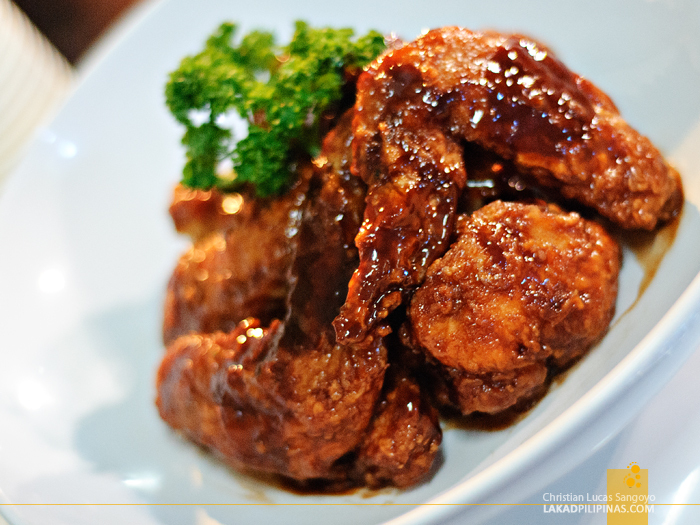 It’s basically a crisply fried chicken wings dipped in spicy sweet sauce. It’s extremely hot that they’d have to pair it with either milk or beer. I chose the latter and started nibbling on the Buffalo wings. It was chili heaven! It is indeed superlatively spicy! And I superlatively loved it! Another line was forming at a hotdog stand at one of Foodgasm’s corner. I immediately queued up and got myself a piece of Schmidt’s Gourmet Hotdogs. 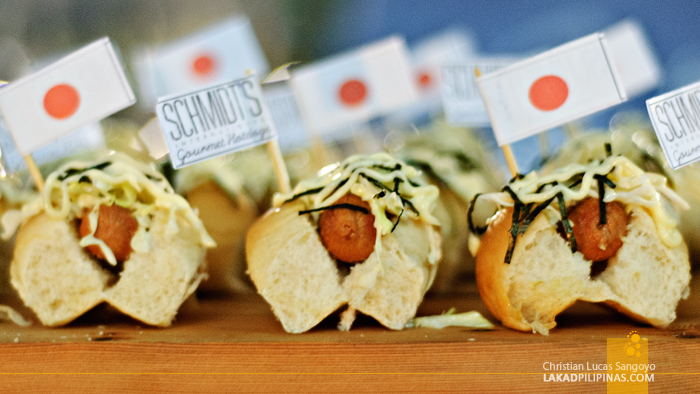 They have a slew of unique flavors but the one they’re giving away were their Japanese inspired Wagamama hotdogs. I found it to be as superb as they promised it to be. In fact, my friend bought a whole bun since she was left hanging by the small portions served to us. Regional delights were also available at some of the Foodgasm booths. One of these is DadsMoms Kitchen’s pork dinakdakan. 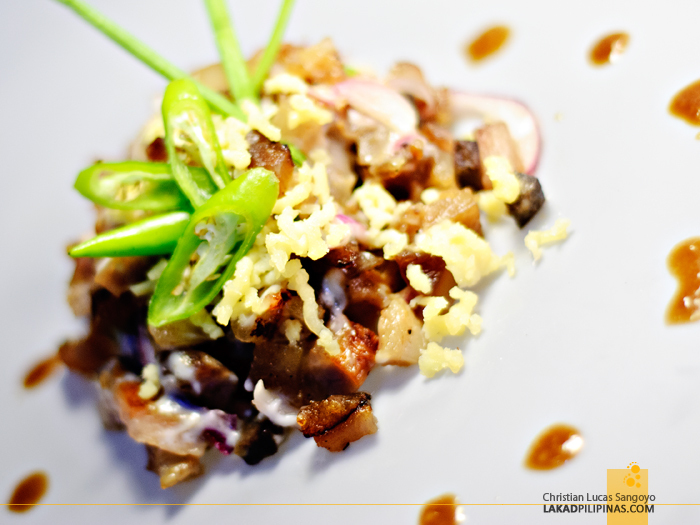 Dinakdakan is an Ilocano dish similar to the more popular sisig and their booth says it’s excellently paired with beer. I loved their dinakdakan, it’s not slimy as I thought it’s gonna be at all; I just wish they served a bottle of beer with it, haha. After going through thirty food booths, I can convincingly say that the best dish of the night for me was Flavor Avenue’s bagnet paella. I absolutely absolutely loved their Ilocanoized version of this Spanish original. I really don’t dig paellas since I usually find it too rich in flavor, but Flavor Ave definitely got its mix right. I’ll let them sum it up for you; Spanish inspired dish with the Filipino twist. 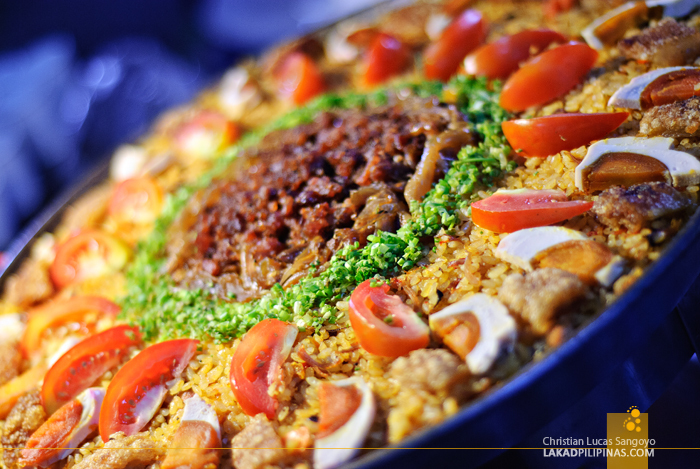 The ultimate BAGNET Paella... slow cooked rice with saffron topped with salted eggs, caramelized onions and native tomatoes loaded with Batac Bagnet Chicharon and homemade longganisa drizzled with our homemade Bagoong Aioli. It was so good, we begged for a second serving, to which they gladly obliged. With my tummy all happy, I can only say, until the next Foodgasm! GPS Coordinates: +14° 33' 16.94", +121° 3' 7.07"